Beyond the aids to navigation that are still operating (and a few that are far off shore, like Ship John Shoal) New Jersey is home to a number of decommissioned lighthouses that are, alas, no longer lit. The Monmouth County bayshore, for example, once hosted lights at Keansburg and Leonardo, right on the waterfront. On a recent ride home from Sandy Hook, I made the spur-of-the-moment decision to seek out the Conover Beacon and the Chapel Hill Lighthouse. There's a good reason why I chose to look for both on the same trip. 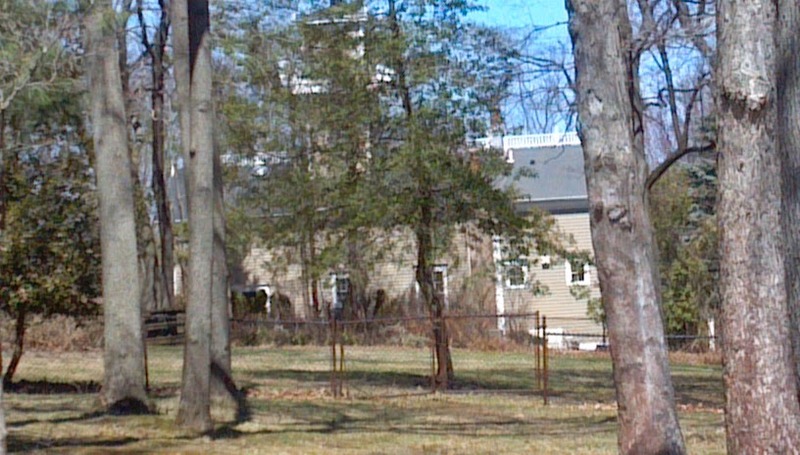 The pair once worked together as range lights to help guide ships through the Chapel Hill channel west of Sandy Hook. Ship captains would look for both lights -- Conover at sea level in Leonardo and Chapel Hill more than 200 feet up in the Navesink Highlands -- and when the lights lined up one directly above the other, the sailor knew he'd successfully guided his craft into the safety of the channel. Two additional sets were constructed, at Keansburg and New Dorp, Staten Island, around the same time, for the same purpose. Water-side Conover Beacon was going to be the easier one to find, if it was still there at all. The area was hard hit by Hurricane Sandy, and the neighborhood close to the waterfront still shows signs of rebuilding. Having not done my homework before making the trip, I didn't know how tall the beacon was, or exactly where it was, and I wasn't seeing any indication of a tall tower anywhere. When I made it all the way to Leonardo Harbor without finding the beacon, I feared it had been washed to sea in Sandy's 10-foot-plus-high storm surges. Then I turned around. Retracing my path and heading along Beach Avenue I found it: a 45-foot tall white and red capped metal tube braced with a skeleton frame. 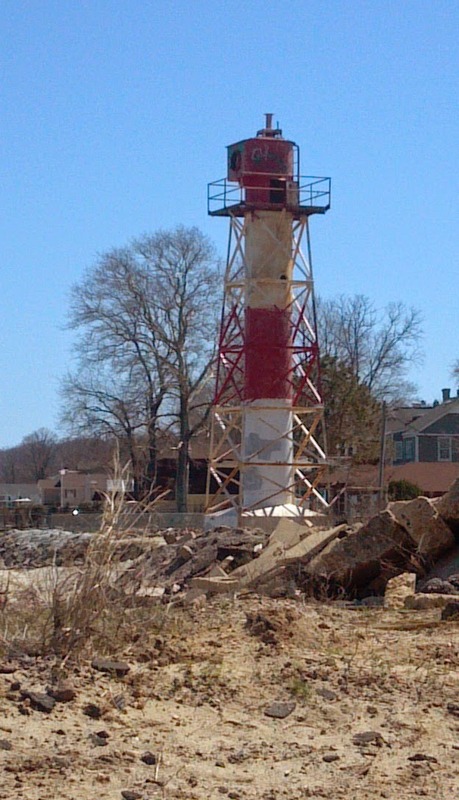 Conover Beacon is a bit battered, pushed off its base by Sandy, but it's still standing. The beach around it still looks rather storm-tossed, with broken concrete strewn nearby. The original light, a hexagonal wooden tower and keeper's house, was built in 1856 on land purchased a few years earlier from Rulif Conover. Ironically, the first keeper's name was Marsh L. Mount, a moniker that you might say foreshadowed the fate of the ill-conceived tower. After a few years, the wood at the base of the tower started to rot in the damp seaside environment, and the light had to be braced with metal mounts. Design flaws extended to the tower's white/red/white daymarks, which became confusing to sailors when the beach was covered in snow. To improve visibility from sea, the Lighthouse Board erected 25-foot tall black screens on either side of the beacon. The beacon itself is no stranger to moving, having previously served at Point Comfort in Keansburg as the front end of the Waackaack Range Light system. When the wooden Conover structure was retired in 1941, Keansburg gave up the Point Comfort tower (some in town are apparently still a bit sore about that), which was moved four miles westward. Most likely, the beacon would have met the same fate had it not moved at all. The Coast Guard deactivated Conover Light in 1957, and it's sat quietly on the beach since then, reportedly the last tower of its type still in existence. Various sources note that property ownership was transferred to Monmouth County in 2004, and a friends organization was assembled to manage and hopefully restore the beacon, but it appears that beyond a new coat of paint several years ago, not much has been done. Conover's partner, Chapel Hill Lighthouse, has fared much better in the intervening years, its location and design working heavily in its favor. Constructed in 1856 on what was once known as High Point, Chapel Hill Light stands more than 150 feet above sea level, giving its lantern room an impressive 224 foot altitude over the bay. The design was rather plain -- a rectangular house about two stories high, with a square tower rising in the middle to accommodate the light. Painted white, it suffered the same "invisibility" complaints as its Conover partner: sailors couldn't discern it from surrounding snow in the winter. Rather than painting the house a different color, the Lighthouse Board erected black screens on either side of the house, just as it did at Conover. days when the government owned the property. Aside from the snow issue and expected storm damage from time to time, Chapel Hill Light seems to have had a reasonably reliable tenure until it was decommissioned and replaced with an adjacent steel tower beacon in 1957. The next chapter of Chapel Hill Light's history is a classic case of the ideal property finding the right buyer. When the Government Services Administration auctioned the site, the winning bidder was a man who bought the property for his son, an amateur astronomer. Natural altitude and the towering lantern room looked like an ideal place to gaze into the stars. Nearly 60 years and several owners later, the lighthouse stands quietly in the affluent neighborhood that's grown around it. Hidden behind landscaping and accessible only by a long, gated drive, it's clearly not looking for visitors, and I respected that when I found it. My research revealed a virtual tour on the website of a contractor who's done some work to enlarge and update the house, showing it's being well cared for. Whether the lantern room is used for any specific purpose is anyone's guess, but I think you'll agree that Chapel Hill Light is in good hands.